1 Wendy: Arrr! We be ready to be findin' and diggin' up the treasure now. 3 Wendy: What difference be it makin' what tools ye be carryin'? 4 Ponsonby: In the Royal Navy we don't allow our crew to be two picky. I was really worried about this strip. Is that actually a shovel, or is it a spade? If I got it wrong, surely I'd get several thousand angry e-mails from readers pointing out how ignorant I am. Wikipedia wasn't much help. 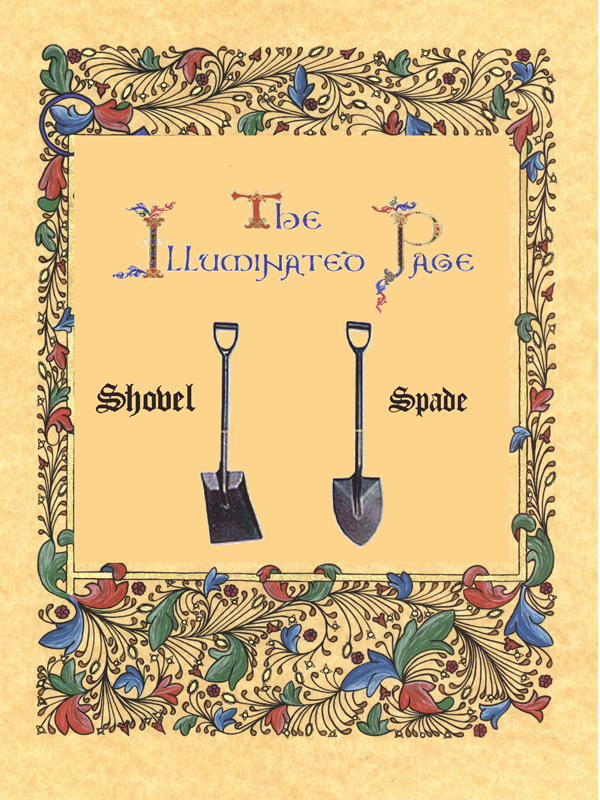 A spade is a "tool designed primarily for the purpose of digging or removing earth". A shovel, on the other hand, is a "tool for lifting and moving loose material". So which is this LEGO® utensil designed for? I dunno. But wait. A spade "is sometimes considered a type of shovel". And a spade's "typical shape is a broad flat blade with a sharp lower edge". At least on the page about spades. The page about shovels says a spade "usually has a point and is designed to be pushed into the soil with a foot. Spade blades usually have a rounded face without sharply upturned sides". So does a spade have a broad flat blade, or a point, a rounded face, and upturned sides? I dunno. Digging further into the difference (pun most definitely intended), I discovered the following page on everything2.com (warning, contains vulgar language): Call a spade a ****ing shovel. This confirms my own experience that here in Australia we generally consider spades and shovels to be basically the same sort of thing, and that "spade" is just a snobby name for a "shovel". So if I was to go on that, Captain Ponsonby would undoubtedly call the utensil in question a "spade", because he's an upper-class British twit and for no other reason. Spades and shovels aren't the same. A spade has a flat rectangular blade, while a shovel's blade is often rounded on the end, and is more scoop-shaped. A spade's blade is in a straight line with the handle, whereas a shovel has a bend behind the blade. If you put a spade's blade flat on the ground, the handle will also be on the ground. If you put a shovel's blade flat on the ground, the end of the handle will stick up to about thigh or waist high because of the bend, which is called a gooseneck or lift. Okay, now I'm really confused. The LEGO® implement in question has a flat, rectangular blade. Therefore it must be a spade according to this paragraph. However, the handle is bent behind the blade, such that if you lay the blade flat on the ground, the handle sticks up, in fact to about waist height on a LEGO® minifigure. Therefore, according to this same paragraph, it must be a shovel. So what is it? A spade or a shovel? I dunno. Hmmm. Let's try here. According to the LEGO® Group, who make the darn thing, it's a shovel. But then, so is this. And this. So what is it really? I dunno. In desperation I turned to a bunch of people on an Internet chat. I should have known better. Someone said a spade is just a small shovel. Someone else said a spade is pointy on the end, which someone else denounced as wrong-headed and ignorant. Someone said spades were actually cutting tools, used to cut peat sods, not digging tools as such. Someone said a spade is big and flat, except if it's being used to move snow, in which case it's a shovel. Pretty soon people were calling each other Nazis and riots were breaking out across North America, and I think The Netherlands declared war on somewhere. And was it a spade or a shovel? I dunno. I was going crazy! Then I found spade-shovels! And shovel-spades! 7 people say spades are used for digging a hole in the ground. 5 people say shovels are for moving loose material, not for digging. 3 people say shovels are used for digging a hole in the ground. 2 people say spades are a subset of shovels. 1 person says spades are a particular subset of shovels designed for use in dirt or earth. 1 person says shovels are a subset of spades. 5 people say spades have points on the front edge. 2 people say shovels have points on the front edge. 4 people say spades have flat front edges without points. 1 person says the front edge of a spade may be pointed or flat. 2 people say the front edge of a shovel may be pointed or flat. 1 person says a shovel has a curved front edge. 4 people say spades have flat blades. 2 people say shovels have flat blades. 4 people say spades have curved blades to better hold the material being spaded. 2 people say shovels have curved blades to better hold the material being shoveled. 1 person says spades have turned up edges to better hold the material being spaded. 4 people say shovels have turned up edges to better hold the material being shoveled. 2 people say spades have flat, not-turned-up edges. 1 person says a spade is actually an implement with multiple tines, like a garden fork. 2 people say a spade has a straight handle in line with the blade. 1 person says a spade has a handle set at an angle to the blade. 2 people say a shovel has a handle set at an angle to the blade. 1 person says a shovel can have either a straight or an angled handle. 1 person says a shovel is any digging/moving tool with a long handle. 1 person says spades have handgrips on the back end of the handle. 4 people say the item pictured in the comic is definitely a spade. 9 people say the item pictured in the comic is definitely a shovel. 2 people say the item pictured in the comic is specifically a coal shovel. 1 person says the item pictured in the comic is specifically a scoop shovel. 1 person says it depends entirely on intent; if the user digs with it, it's a spade, if he moves material with it, it's a shovel, no matter what it looks like. 1 person says it's a shovel if you use it standing up, and a spade if you use it on your knees. 2 people say it's a shovel if you use with two hands, and a spade if you use it with one hand. 1 person says spades are used two-handed. 1 person says it's a shovel if used by a construction or road worker, and a spade if used by a gardener. 1 person says it's whatever the manufacturer calls it. 4 people say the item pictured in the comic is both a spade and a shovel. 3 people say spades and shovels are all exactly the same, the words are completely interchangeable, what's the big deal? 1 (British) person says they're all spades; only Americans call them shovels. 1 person says the item pictured in the comic is actually a spatula. 1 person says the item pictured in the comic is a glaive-glaive-glaive-guisarme-spade. 1 person says, hang on, those other things aren't picks, they're mattocks! Naturally, this clears up my confusion no end. Hello again. I've been reading your Irregular Webcomic! and am enjoying it greatly. I know you appreciate reader feedback, especially on issues that are somewhat more important than standard everyday fare. In that light I wanted to provide what feedback I can in case you need such in future strips. A shovel is flat-front and used for scooping, a spade is sharp-front and used for digging. Of course. Please see following. In hopes this will be of even greater assistance. Then a year and a bit after that, another new reader trawling the archive felt compelled to clarify the situation by providing an authoritative source. He cited the fact that in a pack of cards, the symbols on the suit of spades have a point on the top, ergo spades have points, whereas shovels do not (they have flat front edges).